We can remove the manufacturers label or tag for $0.50 per piece. When placing your order you have the option have tags removed per order and all items for that order will have the tag removed. Please note that we can ONLY remove the brand tag and NOT the legal tag unless you have us apply a new label. There are typically two tags on shirts and one is for the brand and the other is for the legal info. The legal info has things the size, country of origin and a few other things. For legal reasons we can’t remove both tags unless you have us apply neck label to the back that contains all the required legal info. 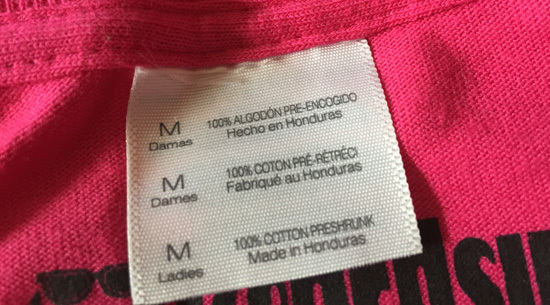 Shirts without tear away labels – The labels are cut off. It isn’t a perfect process and there can be threads that can get loose from where the brand tag was cut. see below.